Just as one day we will run out of names to describe various shades of red in lipstick tubes, I imagine housing developers will one day run out of themed-street names for their new boulevards, avenues and drives. In the old days, streets were named after presidents, types of trees, or were given numbers –Lincoln Avenue, Sycamore Drive and 2nd Street. These days, developers seem compelled to create wonderlands from tangles of streets named after berries, fruits and stones. Boysenberry, Huckleberry, Blueberry / Plum, Peach, Cherry / Stonemaster, Millstone, Stonebridge. My brain doesn’t work that way. All I remember is that to get to Marie’s house, I’m supposed to turn right on some street called Stone-something. I’m a scientist. Why can’t they make a neighborhood with medical or sciency street names that are easier to remember? Who could forget to make the turn onto Pulmonary Edema from Congestive Heart Failure Avenue? And let’s not forget that cute little park by Kidney Stone Way. 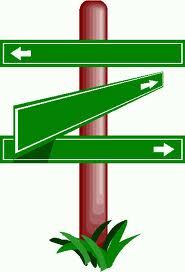 During rush hour you can get there faster if you take the Coronary By Pass and follow the shortcut onto Diarrhea Drive. Why am I not consulted on these matters? I will do almost anything for a fresh stick of gum. I suspect this fascination with a brand new piece comes from my days as a real child in the 60’s. 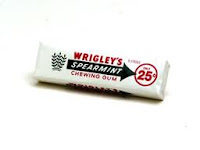 Either we were poor or my mother was just “gum stingy” because we had to nurse a piece of Wrigley’s Spearmint for several days before we were allowed to open a new one. We had designated safe places to store our precious gray wads to keep them from getting stuck on the back of some magazine or tragically thrown away prematurely. Between meals it was OK to place our gum on the edge of our dinner plate. With the milk downed and the veggies cleared out of my teeth, I’d pop it back in for another tumble. Overnight the chewed gum could be stored in a special place on the counter. My sister had her spot and I had mine. Now I live large and buy spearmint Orbit in bulk at Sam’s Club like a doggie treat to reward myself when I complete a heinous grown-up task. Like a spoiled dog grown fat for simply doing what a dog should do – come, stay, pee somewhere that’s not on carpet – I’ve come to expect a fresh stick of gum whenever I fold a load of laundry, clean the hair out of the drain (I get 2 for that) or when I’m able to finish reading 10 pages of something boring. I started this trick in college to get through countless chapters of Physics and Physiology, but was on a budget then and was stingier with my treats. Now I have more disposable income and home ownership affords me lots of opportunities for self-treating; there are countless yucky things to do when you own a house. Last week we were remarkably proactive and caulked a silly-putty-like substance between the squares of cement in our driveway. We also filled each and every pockmark in our pavement BEFORE the driveway crumbled into ruin. I was so proud that I almost forgot to freshen my blow. I’m such a child.